Vancouver, BC – September 18, 2018 – Comstock Metals Ltd. (TSX-V: CSL) (“Comstock” or the “Company“) is pleased to report results from its Rawhide Cobalt-Silver Property, Ontario. 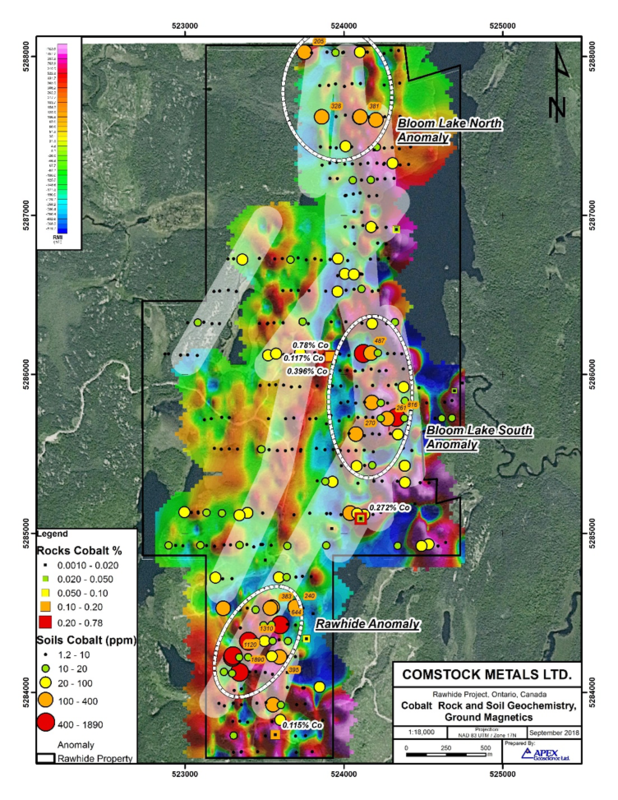 The soil results are very encouraging because of the presence of multiple high priority Cobalt soil anomalies throughout the property and high-grade cobalt rock samples. Highlighted by several samples of high levels of cobalt just north of the Rawhide shaft area. During July 2018 the Company’s geologic consultants, APEX Geoscience Ltd. (APEX) completed a surface exploration program comprising the collection of 30 rock grab samples, 381 humus soil geochemical samples, and data from 41 line-km of ground magnetic geophysical survey on the Rawhide Property (Figure 1). Soil samples were collected at 50 metre intervals along 100 or 200 metre spaced east-west gridlines; with ground magnetic geophysical data collected along 100 metre spaced east-west oriented lines. The Rawhide Property is underlain by an approximately 1 km wide north-south trending Nipissing diabase sill that is interpreted to dip shallowly to the east subparallel to bedding within Cobalt Group (Gowganda Formation) metasedimentary host-rocks. The Rawhide Property contains numerous historic mineral occurrences comprising shallow prospect pits, shafts, and adits targeting diabase-hosted silver-cobalt-copper bearing quartz-calcite veins. From south to north these occurrences include: The Rawhide shaft; McRae Lake shaft; Shanty Lake pits; Fletcher shaft and pits; and Bloom Lake adit and pits. The July 2018 reconnaissance rock grab sampling focused on ground truthing the historic mineral occurrences. Results include five (5) samples returning greater than 0.10% cobalt; and up to 0.78% cobalt (18KBP016) collected from a quartz-calcite vein within an historic prospect pit discovered west of Bloom Lake (See Table 1). Rock sampling at the Rawhide shaft returned values of 0.12% cobalt (18KBP023), and 0.27% cobalt 650 metres to the northeast from the McRae shaft. These cobalt anomalies are associated with significant copper and silver values. A total of 7 rock grab samples returned greater than 1% copper, and up to 3.85% copper (18KBP015); and 8 samples returning greater than 10 grams-per-tonne (g/t) silver, and up to 155 g/t silver (18KBP027). Note: grab samples are selected samples and are not necessarily representative of the mineralization hosted on the property. The cobalt found in the humus soils defines a greater than 20 parts-per-million (ppm) north-south trending anomaly which extends from the Rawhide shaft area in the south for a distance of 4.4 km to the northern Rawhide claim boundary (See Map at Figure 1). There is a clear association of anomalous cobalt (plus multi-element silver-copper-lead-zinc) in soil values with a strongly magnetic phase of the diabase unit as indicated by the July 2018 ground magnetic geophysical survey in the Rawhide Property. The cobalt in soil anomaly is also spatially associated with the mapped trace of the north-northeast trending McRae Lake fault, passing through McRae Lake and Bloom Lake to the north. Cobalt, silver and base metal anomalies are closely associated, and their spatial distribution along north and northeast trends are interpreted to indicate there are strong lithologic and structural controls on mineralization at the Rawhide Project. Of the 381 soil samples, a total of 23 returned greater than 100 ppm cobalt; including 4 samples returning greater than 0.10% cobalt and up to 0.19% cobalt (See Table 2). Significantly, all 4 plus 0.10% cobalt soil samples occur along an apparent 600 x 200 metre northeast trend greater than 200 ppm cobalt anomaly proximal to the historic Rawhide and McRae Lake shafts. The greater than 200 ppm Bloom Lake South cobalt in soil anomaly lies 1.6 km to the north of the Rawhide anomaly and occurs over a 600 x 200 metre north-south trend at the south end of Bloom Lake. A further 2 km to the north lies the 400 x 400 metre Bloom Lake North greater than 200 ppm cobalt in soil anomaly. Comstock is very encouraged by these results and is in the process of applying for an exploration drill permit to conduct a drill program on the Rawhide Property this fall. The analytical work reported on herein was performed by ALS. ALS is an ISO-IEC 17025:2017 and ISO 9001:2015 accredited Geoanalytical laboratory. The Company follows industry standard procedures for the work carried out on the Rawhide Cobalt-Silver Property. Given the reconnaissance nature of the samples submitted (select rock grab and humus soil) the Company has relied on the internal quality assurance/quality control (QA/QC) measures of ALS. In addition, 1 in 20 humus soil samples were collected in duplicate to assess repeatability. Comstock detected no significant QA/QC issues during review of the data. Kristopher Raffle P.Geo., Principal, of APEX Geoscience Ltd., a Qualified Person as defined by National Instrument 43-101, supervised the exploration work at the Rawhide Cobalt-Silver Property and reviewed, verified, and compiled the data reported herein. Mr. Raffle has reviewed and approved the scientific and technical disclosure in this news release.